An excellent obituary for Noel MacDonald appeared in today's Globe & Mail, and I think it's something everyone should read. 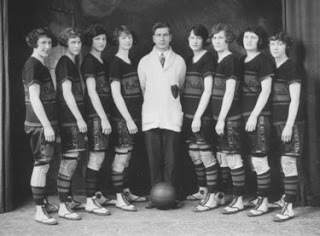 MacDonald was a member of the Edmonton Grads, the most dominant sports team in Edmonton's history, and their all-time leading scorer. I don't know why the obituary appeared today rather than when she passed in May, but I'm sure glad I got the chance to read about this amazing woman. I hope you enjoy it, too. The obit notes that MacDonald is the third Grad to die in just over a year, and that only four members of the Grads are still alive. This is both amazing, and a little bit sad. When they are gone, so too goes an important part of this city's history. Yet I couldn't tell you who any of those women were, and are, and I wouldn't be the only one. Myself, I'd like to know more about those four living Grads. Here's hoping I get to hear their stories somewhere along the line. Glove tap to Avi for the link. The obits page is meant to be features on noteworthy people who have recently died, not small recounts immediately after they do. That Grads story is a good example — a lot of background research goes into something like that. Along the "Avenue of Champions," which has admittedly fallen into disrepair in many ways, there are murals of important athletic teams and events connected to Edmonton. The Eskies one and the Oilers one are kept up wonderfully along with a couple generic ones but the Edmonton Grads one is cracked and peeled away. Now as a kid brought up on basketball out east - the Grads were a story I knew pretty well, better than anything about the Eskimos and they probably had as much mystique as the Oilers for me. I find it incredibly sad that theirs is the only mural not to be kept up. I have written to the city about this and had no response. It's such a great story and a real part of Edmonton (and Canadian) sports history and deserves some real coverage. And I wish they'd fix that mural up in the rich sepia tines it deserves.